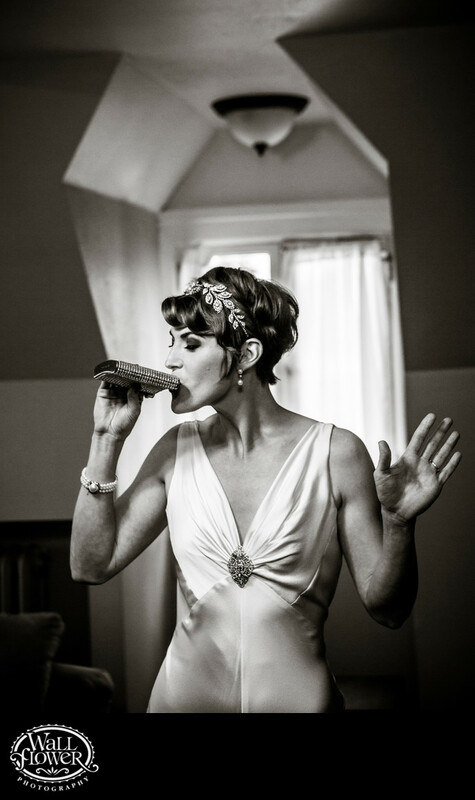 This bride makes even taking a pull from a flask look elegant, with her 1920s "Great Gatsby" era style in a third-floor room in the Weyerhaeuser Estate, which happened to be built in the same decade. The lines of the dormer window behind frame her nicely, and the black and white effect gives the photo a classic look to match the era. The Weyerhaeuser Estate, located in a quiet neighborhood in North Tacoma, is a huge brick mansion with many beautiful settings and viewpoints that photograph very well. You'll find more photos from weddings there in several galleries on this website.